G-Cuff is a complete tissue management solution for dental implants that retracts and supports tissue, safely carries an abutment, and blocks the flow of cement. For this evaluation, 11 dentists used G-Cuff for about 4 weeks and used it in a variety of clinical procedures. 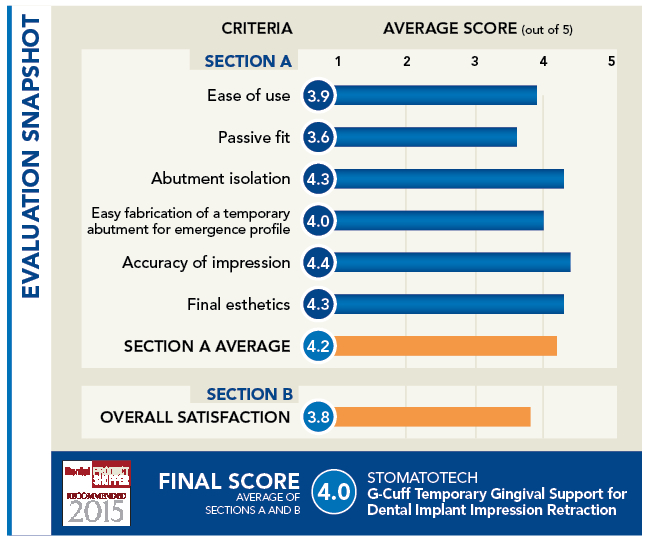 They then rated it for ease of use, abutment isolation, and impression accuracy along with other factors. Manufacturer Description: G-Cuff is an easy-to-use, multipurpose implant accessory that allows for noninvasive tissue retraction, supports the tissue to prevent collapse, creates a barrier to prevent cement and adhesive from invading the tissue, and effortlessly transports and handles an abutment. G-Cuff’s unique size succession makes it universal and compatible with almost any implant brand and system. A kit contains 48 disposable G-Cuffs, 6 of each size from 1 to 8. Manufacturer Description: The G-Cuff device allows for noninvasive tissue retraction to isolate an abutment for clear digital scans and accurate impressions. It’s compatible with popular digital technology such as CEREC, E4D, iTero, 3SHAPE, and others. Evaluator Feedback: A dentist from Philadelphia who rated abutment isolation as excellent said the G-Cuff “isolated very well.” When asked what he liked best about the product, a Virginia evaluator said, “Tissue management control and retraction and isolation.” One dentist had trouble getting the cuff to go around the abutment, and another would like to see improved “sizes of abutments on G-Cuff.” G-Cuff is “definitely a product that makes implant isolation use much easier,” concluded an evaluator who has been practicing dentistry for 10 years. Manufacturer Description: When used as an alternative to any retraction method or technique, a G-Cuff collar creates an accurate impression where the core is visible and the margins are clear.